Koh Phi Phi Krabi remains in visitors thoughts long after they leave. 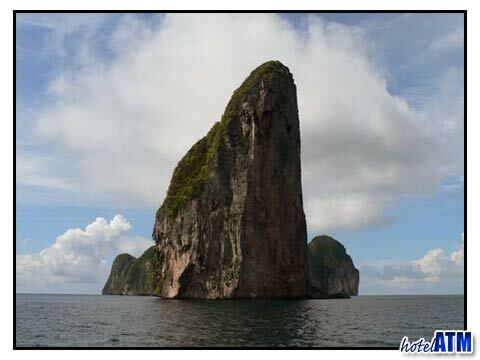 The Islands of Koh Phi Phi Don, Koh Phi Phi Ley, Bamboo Island National Park , Mosquito Island and the diving outcrops of Bida Nai and Bida Nok inspire memories of cliffs, coral, jungle, beach and a lot more. Koh Phi Phi Krabi is at the southern half of the Phang Nga Bay and equidistant between Phuket and Krabi Provinces. It is so mountainous that there are no roads or cars and the main village has 80% of the accommodation. This concentration of people means that although Koh Phi Phi Krabi is a small holiday location it is buzzing with a great cafe-restaurant and bar scene. Koh Phi Phi has the main pier and receives the day tours in from Phuket, Krabi and Koh Lanta as well as services the sightseeing, snorkeling and diving tour boats that go from beach to beach. Koh Phi Phi Krabi is a hot favourite for movie going buffs and the traveller scene, with visitors checking out the perfect beach at Maya Bay. Maya Bay on Koh Phi Phi Ley was the location of "The Beach" movie where Leonardo Di Caprio played the anti-hero whose desire to find the perfect existence away from the corruption of the modern world goes horribly wrong. The movie wasn’t a great success as a story but it certainly put Koh Phi Phi Krabi on the map as one of 'the' great beauty spots of the world. The other great pull for Koh Phi Phi Krabi is the diving. Over 20 km of deep and shallow reefs and over 7 open water dive sites within 45 minutes of the main diving pier ensure that the island is a mecca for those who can't resist blowing bubbles. In fact, as a diving destination close to the reefs, the islands rank as Thailand’s best. The first diving starts at the 30 m deep pinnacle dive Hin Dot dive site which is just 5 minutes from the pier. The main Koh Phi Phi Krabi dive sites are out at Koh Phi Phi Ley, Maya Bay and Bida Nok and Bida Nai. For the more adventurous and definitely more experienced there is the King Cruiser Wreck dive, the 'forbidden' Cave dives and the 60 m pinnacle Hin Daeng. Alongside the excellent range of dive sites that can keep you busy for weeks, there are 20 dive schools that can get you started on the path of diving. Internationally recognized and monitored PADI courses are available and start every day of the year. Traditionally this is a 4 day course but there is such a thing as a PADI run 'Discover scuba' course that gives you a one-day-taster by ensuring that you dive within very safe limits. There are many Koh Phi Phi Krabi tours on the island ranging from speedboat, Shark watch, cliff jumping, kayaking, to the humble but very enjoyable sightseeing tours. The Koh Phi Phi Krabi tour menu compares the main features and itineraries of the tours and lets you discover which works for you. It also shows the tours available if you are staying in Phuket or Krabi and wish to visit the islands for just a day. 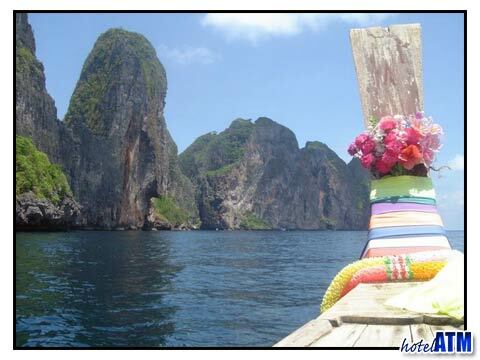 These tours are door to door so the pick-up is at the reception of your hotel in Phuket or Krabi. Koh Phi Phi Krabi nightlife is focused on the main village. There are a slew of varied restaurants with fine dining menus all the way over to simple local curry houses that serve the fresh fish pick of the day. The choice is yours. As most of these are in the village, the party often starts here at bars like The Dojo and The Reggae bar. As the night warms up many head to the beach and hang out at Loh Dalum at bars like Slinkies, Apache, and the Hippies Beach Bar. Koh Phi Phi Krabi luxury and beachfront accommodation of the Zeavola Phi Phi Resort, Holiday Inn Phi Phi Island and Phi Phi Island Village Resort And Spa are primarily in the north of Koh Phi Phi Don. These resort gaze east over the Krabi province horizon, a view studded with islands and mountains. Most of the beachfront accommodation, guesthouses and hostels can be found in the main village near the pier. Accommodation room rates on the island can be surprisingly high so for people with a budget in mind check out these two links; Cheapest Phi Phi Hotel deals in Paradise and Cheapest guesthouse in Koh Phi Phi. Further accommodation locations on Koh Phi Phi Krabi are the stunning Long Beach which is just 5 minutes from the main village and Runtee Bay where there are some remote settings for an island holiday stay. Some people use the Maya Bay Camping tour as accommodation. May Bay Camping can be useful during very busy days when you might need to wait for your room.